Tragedies will always abound, but I wanted my first post for 2009 to be about feel-good stories which give a positive spin to our otherwise dreary existence. And what could be a more joyful occasion than that of the birth of a baby ? That’s what the whole Christmas thing is supposed to be all about, at least on a superficial level. And Manny Pacquiao is a blessed man in this regard. Wife Jinky gave birth to a 7.9-pound baby girl at the Los Angeles Metropolitan Hospital just as the year was ending, with him present and even cutting his baby girl’s umbilical cord. Her name is Queen Elizabeth and is the Pacquiao couple’s fourth child. Manny is no Anglophile, as far as I know, but the name is somehow apt. There’s no parent that wouldn’t want their daughter to be an empress, even if only in name, and her arrival can be said to be the crowing event of a felicitous year for Pacquiao. And the upbeat symbolism of a baby at the start of a new year can hardly be missed. She will be seen as a harbinger of better things to come. Our best new year’s wishes to the new queen of the Pacquiao household. 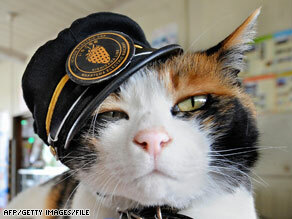 Another story I saw at CNN concerns a cat in a hat who is said to be worth US$ 10 million. As a latecomer to the cat-appreciation tribe (I had to be kicked dragging and screaming into the feline world by my wife and kids), I still find cat stories enthralling. Tama is a 9-year-old calico cat, who used to live a simple life hanging out at the train station next to her home at the grocery store. But with the addition of a hat, usually worn at a jaunty angle, she’s become a local, national and even international star. Tama’s home of Kishikawa in Japan is an isolated town of just a few thousand people, the last stop on what had been a failing train line. That all changed when the Wakayama Electric Railway decided to use Tama as a mascot. They called her a “Super Stationmaster,” made a promotional poster for train carriages and gave her that stationmaster’s hat. Now tourists flock here to see the cat and to snap a picture. “It’s a chance to take a break from the problems facing Japan,” said Haruto Maeda, who took the day off work to see Tama. As well as their cameras, visitors are bringing their cash. A study at Osaka University found that Tama fever was responsible for pumping $10 million into the local economy. Tama merchandise abounds, empty train carriages are now full and the line is no longer facing bankruptcy. The town of Kishikawa is enjoying an economic turnaround amid the national and global slowdown. Tama now lives full-time at the station, with her mom and a friend. She’s the prize of the town’s locals who say that in these tough economic times they’ll take a gift horse — or cat — wherever they can get it. i’m glad that at least in some part of the world, people haven’t turned too cynical & jaded & can appreciate this small bit of quirkiness.